Enjoy the stability and power of a heavy-duty stationary planer with the versatility of shop mobility in one precision 15" Planer. 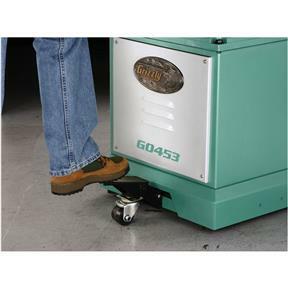 Simply press down on the foot pedal to raise the planer on its wheels for positioning just about anywhere, or push the lever up to lower the planer down for rock-solid stability. A 42" long bed with cast iron wings and bed rollers provide all the support needed for perfectly planed lumber. Heavy-duty construction and materials will have you planing all day long. 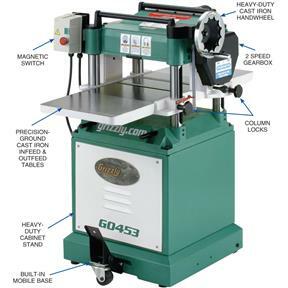 Check out all the other specifications and design features and roll one of these planers into your shop! CSA certified meeting CSA C22.2 #71.2-10 and UL 987-8 standards! 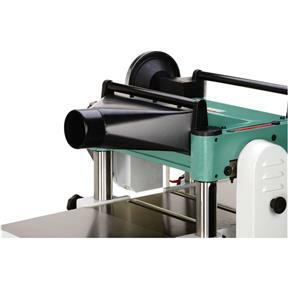 Knife size: 15" x 1" x 1/8"
This is a excellent planer. I upgraded the head to the spiral head and love it. works very well, have purchased a spiral cutting head but hasn't arrived yet.. would recommend spiral over reg. cutters as you can change them when a cutter is bad. 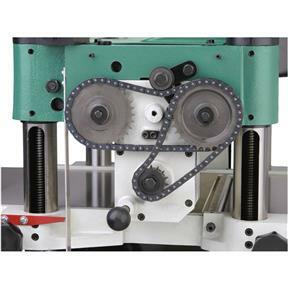 This planer is well engineered and assembled with precision. Love the mobile base feature, too. Well it took awhile because the delivery truck dumped the first one over in the street. Grizzly did a great job of reshipping and the second one arrived in good shape. I am handicapped so it took me a week or so to put it all together and hook it up. Then I added a Wixey digital height gage to complete it. I just started using it today but it seems to be a very solid machine and planes the wood smooth. I've used large wood planers like for many years and this machine is an excellent value. I received the planer in February of 2018. I've had a few months of running it and have maxed out its width and height with cherry, poplar, walnut, oak, and a couple other types. This thing has handled every thing I have thrown at it. I have only had to sharpen the blades once but that was because of a knot coming loose. 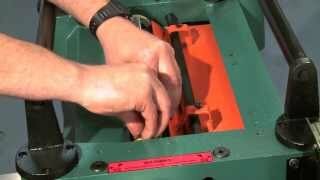 I would definitely recommend this planer to anyone looking for a planer. 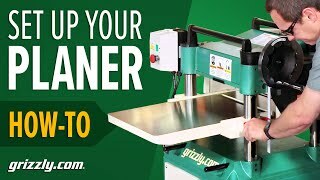 Although we have not had sufficient time to fully evaluate the Grizzly GO453 - 15' Planer since we purchased the unit, our initial evaluation is extremely positive. I love this tool, so don't take me pointing out a few of the flaws I had to deal with as a non-recomendation. 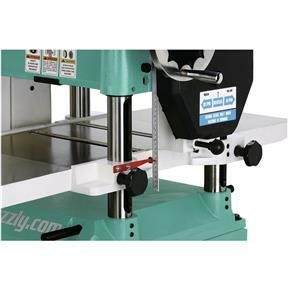 It is a "heads up" for those of you looking to get a good inexpensive shop planer. 1. My gear oil leaked out in shipping. The unit is covered in oil, so it will probably leak for life. When you get to the setup step that says "check the oil as it may have leaked out in shipping" follow that step as it is there for a reason. 2. My unit would not power on as the relay assembly was not seated well in the power control housing. 3. When running there was a metal on metal sound in the motor. Removing the fan shroud revealed that the fan was not installed correctly (had come free) and the retaining clip had broken free. I installed it correctly and replaced the retaining clip. Once done with these DIY chores, it runs like a champ. It is solid, user serviceable and built to last. However if you are not mechanically inclined, it may not be the unit for you as part of the cost savings appears to be very little quality control "across the ocean". I finally received my planer and it was well worth the wait. 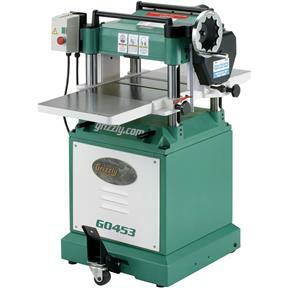 My son I I decided to purchase the G0453 planer for our work shop. Our setup and initial trial runs were successful. We look forward to continuing to use the G0453. This planer GO453 is a very nice planer, it is more than I hoped. Very pleased with , does a nice job plus vey low noise , shipping was quick. Thanks Grizzly for a great machine. Randy D.
Have had this machine in my shop for about a month now and it is a work horse. Very solid built and easy to use. It took me about a day to inspect and degrease the planer before I first used it. I have 48 years of woodworking experience and wanted to make sure everything was correct like the manual requested. I like the low feed rate, the machine cut clean with little tear out. The rear feed roller leaves fine teeth marks. I had read about this issue before I purchased this planer. I hope they will decrease with use. I don't like the idea of having to change the gear oil after the first 20 hours. I found my oil was low before starting. I found a clear tube to use to add oil and still wasn't as easy as it could of been. I hope it last as long as my old 15 5/8" Makita planer that this replaced. I'am glad to have this machine. It has enough power to plan 15" boards. The machine looks and runs smooth. Heavy made to last piece of equipment. Too many things are made to fail in this throw-away society we live in. But Grizzley has not followed the pack. Rather they have set the trend to get back to making quality products for the consumers. Even down to the smallest details , for example, normally when things have to be assembled by the buyer, the manufacturer provides little to no tools. Grizzley provided real life size hex and allen wrenches, not those cheap never use again Wow I was impressed! Since my planer arrived, I have used it almost everyday. I am about to go use it to plane some boards for a neighbor who wants some cedar boards planed for his closet in their new home. I bought this as an upgrade to my Dewalt bench top planer. I am not a pro but am undertaking a complete kitchen remodel and am doing all the processing of face frame and door material from unsurfaced ash. The thought of running all that through my little planer and having it scream at me for hours on end was, well, discouraging. After quite a bit of research including reading reviews like this, I settled on the G0453. I will restate that I am not a pro. But, boy, what an upgrade. Whereas I used to dread running stock through my little planer, it is now truly satisfying. The Griz planer is quiet, and the dust collection is great. It is also more mobile than expected. No trouble setting it up, even with me alone unloading off a pallet. I get a little tear out on curly grain, but that is as expected. This has worked out very well for me, and I am glad I pulled the trigger. When we set up our dream workshop 17 months ago, we chose all Grizzly stationary tools for their value. 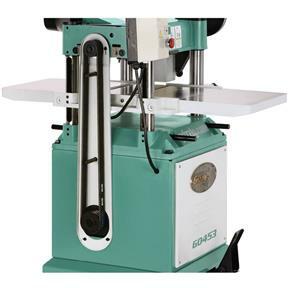 We chose this planer because of its 15-inch capacity, weight (heavier is better) and built in mobile base. While it does the job, these are the problems we encountered. 1. Our first project used Western armed cedar. Deep marks were left on the work by the infeed roller. 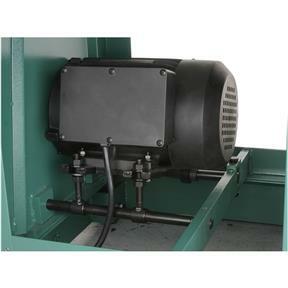 Raising the infeed roller is non-trivial because the gearbox almost completely prevents access to the right jam screw. You can't see it from the right side. Since any modification on one side affects the other, it took hours to get it adjusted so it did not gouge our work piece. My advice, loosen the jam nut only as much as absolutely necessary. 2. While the manual is complete, often steps are out of order. Rely on your common sense. 3. The manual and YouTube video tell you to do some glaringly wrong things: in particular, shifting the gearbox into neutral with the power disconnected and the planer not running. Following these contradictory directions could lunch your tool. 4. The manual and tool labels say to lube the feed roller tension springs every 24 hours of operation. The video says every 8. Oops. Am I screwed by following the manual? Don't know how Grizzly will address its own errors. Will it blame buyers? Have not run into that problem because I read the manual and watched the video. But, you don't? No clue. Buyer beware. 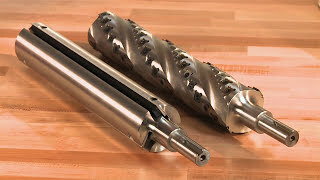 To buy the spiral cutter head for the G0453 was $495 (also free shipping)....so by buying the G0493, and buying the spiral cutter head separate, I saved about $170 AND got a back up cutter head, not a bad deal. I finally put it all together a couple of days ago and used it for the first time yesterdayà.all I can say isà WOW...smooth as silkàno vibrationà.WAY quieter than my old Delta (I guess because of the spiral cutter head)....the over size in feed and out feed tables are greatàand it needed VERY LITTLE adjustment out of the box. It was one of the easiest machines I have ever put together. To anyone looking for a GOOD mid size planer, and not wanting to take out a second mortgage on their house to do so, I Highly recommend looking at the G0453. You will not be disappointed !!! !